The objective of this study is to determine the level of fulfilment of five acquisitions aimed to gain the students in the “Adventure of Democracy” unit of “Power, Management and Society” learning area of sixth grade social studies lesson taught in Turkey, in terms of different variables. The number of researches investing the level of fulfilment of Social Studies lesson’s acquisitions in Turkey is quite limited, and one of the quantitative research methods, the survey method was used in this study carried out for filling this gap in the literature. The academic success test was used in order to collect the research data, the data obtained were analyzed using the SPSS program. At the end of the research, it was observed that the level of fulfilment of the unit’s acquisitions is at intermediate level among students; the level of learning increases with the increase in the level of education of the parents, but this difference is not statistically significant; the academic success of the students living in the city is significantly higher than the students living in the village; and the academic success of the students whose family income level is below 750 TL is significantly lower than the students whose family income is above 750 TL. Akgün İ. H. (2013), Sekizinci Sınıf Vatandaşlık ve Demokrasi Eğitimi Dersinde Örnek Olay Yöntemiyle Öğretimin Öğrenme Düzeyine ve Kalıcılığa Etkisi. Ph. D. Thesis (Unpublished), Elazığ: Fırat University. Büyüköztürk Ş, Çakmak E, Akgün Ö.E, Karadeniz Ş. and Demirel, F. (2013), Bilimsel Araştırma Yöntemleri. Ankara: Pegem A Yayıncılık. Coşkun N. and Samancı O. (2012), İlköğretim 4. ve 5. Sınıflarda Sosyal Beceri Düzeyi ile Sosyal Bilgiler Dersine Yönelik Tutumların Çeşitli Değişkenler Açısından İncelenmesi. 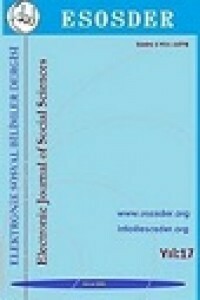 Journal of Educatıonal and Instructıonal Studıes In the World, Vol. 2, Issue: 1, P. 32-41. Flowers N. (2010), Pusulacık Çocuklar İçin İnsan Hakları Eğitimi Kılavuzu (Çev: Çulhaoğlu M.) İstanbul: Bilgi İletişim Grubu Yayıncılık. Gelbal S. (2008), The Effect of Socio-Economic Status of Eighth Grade Students On Their Achievement in Turkish. Education and Science, 2008, Vol. 33, P. 1-13. Gündüz M. and Gündüz F. (2007), Yurttaşlık Bilinci. Ankara: Anı yayıncılık. Karasar N. (2007), Bilimsel Araştırma Yöntemleri. Ankara: Nobel Yayın Dağıtım. Keith T. Z, Keith, P. B, Kimberly J. Q, Sperduto J, Santillo S. & Killings S. (1998), Longitudinal effects of parent involvement on high school grades: similarıties and differences across gender and ethnic groups. Journal of School Psychology, 1998 Vol. 36, P. 335-362. Kılınçarslan S. (2008), Ebeveynin Sosyoekonomik ve Kültürel Düzeyinin İlköğretim Öğrencilerinin Okul Başarılarına Etkileri ve Bir Uygulama. Master’s Thesis (Unpublished), İstanbul: Beykent University. Kotaman H, (2008), Türk Ana Babalarının Çocuklarının Eğitim Öğretimlerine Katılım Düzeyleri. Uludağ University Journal of the Faculty of Educatıon,, XXI (1): 135-149. Oruç Ş. and Akgün İ. H. (2010), İlköğretim Sosyal Bilgiler 7. Sınıf Öğrencilerinin Grafik Okuma Becerisini Kazanma Düzeyleri, International Journal of Eurasia Social Sciences Volume:1, P. 51-58. Parker W.C. (2009), Social Studies in Elemantary Education (Thirteenth Edition). The United States of America: Perason Education. Inc.
Savaş E., Taş, S., and Duru, A (2010), Factors Affecting Students’ Achievement in Mathematics. Inonu University Journal of the Faculty of Educatıon, April 2010/ Volume. 11, Issue. 1. pp. 113-132. TDK (2009), Türkçe Sözlük. Ankara: Türk Dil Kurumu Yayınları. TTK (2010), İlköğretim Vatandaşlık ve Demokrasi Eğitimi Dersi (Sekizinci Sınıf) Öğretim Programı. Ankara: Talim ve Terbiye Kurulu Başkanlığı Yayınları. Uygun, O. (2003), Demokrasinin Tarihsel Felsefi ve Ahlaki Boyutları. İstanbul: İnkılap Kitabevi. Yeşil, R. (2002), Okul ve Ailede İnsan Hakları ve Demokrasi Eğitimi. Ankara: Nobel Yayın Dağıtım. Yılmazer, A. and Demir S. B. (2014), Ortaokul Öğrencilerinin Sosyal Bilgiler Dersine ve Sosyal Bilgiler Öğretmenine Karşı Tutumları ile Akademik Başarıları Arasındaki İlişkinin İncelenmesi. Turkish Studies-International Periodical For The Languages, Literature and History of Turkish or Turkic, Volume 9/2 Winter 2014. pp. 1705-1718.